It looks like a 250, it feels like a 250. The difference is apparent only after a few miles in the saddle of this 305cc sporster. 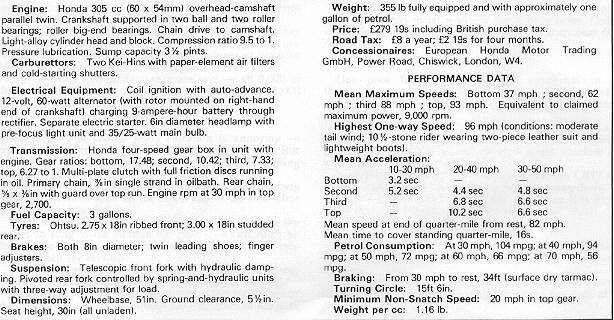 A mere 5.8cc seperates the two models. Yet this very difference adds up to a worthwhile bonus in punch and accelseation. The 305, at 96mph is fast - and decidedly quick off the mark, with a stanging quarter-mile in 16/s. This is over a second better than the 247cc twin. However much the 250 impresses, it's bigger brother cannot fail to be that muck better. It is everything one expects from Honda, together with a helping of big-bike punch that comes as a plesent surprise. Closley allied with performance are revs. All 9000 of them. The CB77 thrives on them and isn't happy until 5000 have accumulated on the neat revmeter dial. One poor feature was a slight roughness in the transmission as the clutch was engaged. However, previous experience has shown that this is peculiar to the particular model on the thst. The machine is slightly overgeared in top. 9000rpm represents 103mph, but patient repetition of electronically timed runs proved 96mph to be absolute top whack under normal conditions. Nevertheless, 96 in not too muck effort for the CB77 and there is a margin for the day when you are going downhill or there is a force 8 gale behind you. Then it is highly likely that you will pass the magic 100 mark. Although some 4mph fast at 30 mph, the speedo came progessively better until at 80mph, it was almost spot-on. 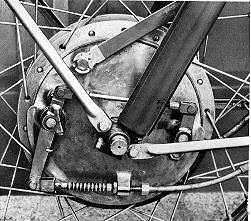 After 90mph, pehaps because of high-frequency vibration, the instrument was optimistic to the tune of 10mph. For such good performance you expect good brakes. And you certainly get them on the 305. Very smooth and progressive, with no tendency for premature wheel locking. That's a description of the potent twin-leading shoe stoppers. They were much more efficient at high speed than the 34 feet braking figure from 30mph would indicate. 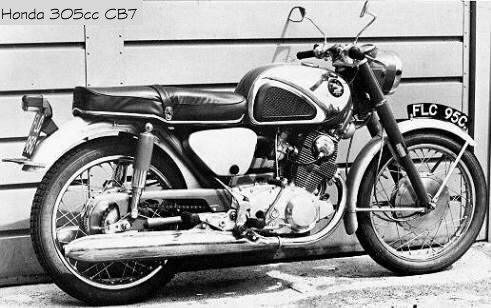 It comes as a surprise to anyone sitting on such a potent bundle of cc that the CB77 in endowered with an electric starter. It is a starter of the utmost reliability and efficiency. 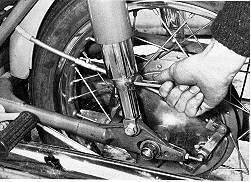 Since the auxiliary kick-starter operates in a forward direction it is well that the exectric starter is so efficien - for the crank can not be used when a fairing is fitted. One press of the button an dthe unit fires up almost immediately. When the engine is cold the air slides must be closed - and it will stall if the throttle is opened above a tick-over before the engine has warmed up. 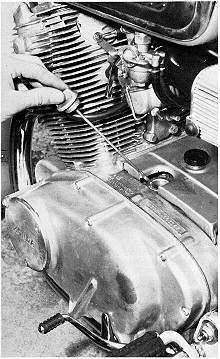 Best drill is to start on a wisp of throttle and allow the engine to run at 1500 to 2000rpm for about 2 minutes, gradually opening the choke. The book says, warm her up, and warm her up you must. Electris starter bolts to front of crankcase. Engine unit doubles as frame structural member. 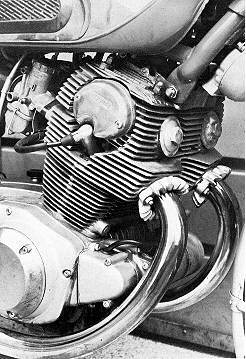 No topping-up of the oil sump was necessary throughout the 1000 mile test, and the power unit remained markably clean. Wiyh fully adjustable controls the Honda, is soon tailored to fit any rider. It is extremely confortable and is superb for tucking in and getting down to it. Handleing needs only slight improvement to make it perfect. There is undoubtedly still a trace of underdamping in the suspension. It would be passed off as unimportant on a lesser machine, but with the potiental of the CB77 the tendency to wallow on bumpy corners can be rather disconcerting. For night riding the main beam intensity was adequate for 50 60mph crusing. A good feature is the clear top cut-off to the dipped beam. Whichever way you look at the Honda, whether yo ulike a high revver or not, there is one thing on which everyone must agree; the detail finish is excellent. From the twin-leading shoe brakes to the revmeter and speedo unit, everything is just so. For your 280Pound you get an economical, high performance sportster plus a liberal help of the sort of quality you would expect only on a much more expensive machine. 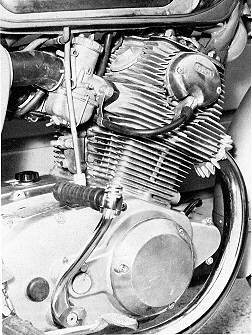 Folding kickstart, and behind top cover, the twin contact breakers driven from righthand end of overhead camshaft. Cam adjusters on the 3 load rear units which have cleves lower ends.